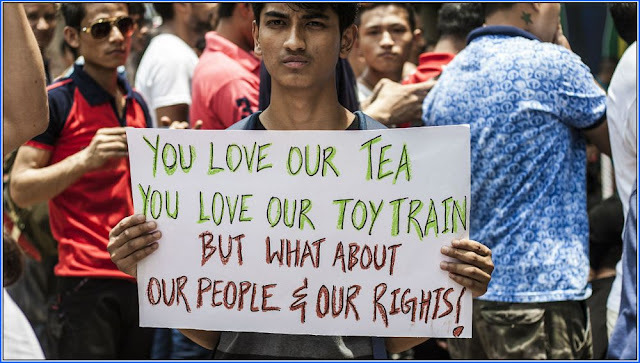 Darjeeling: Gorkha Janmukti Morcha (GJM) on Saturday condemned the reference to and labelling of India’s Gorkha community as immigrants from Nepal, as suggested by the tribal affairs ministry. Replying to an RTI filed by a political entity from the Hills, the ministry suggested the Registrar General of India (RGI) is of the opinion that granting tribal status to the 11 Hills communities would lead to “increase of influx of Nepalese immigrants” into the country. While protesting the ‘immigrant’ reference’, GJM’s Binay Tamang-Anit Thapa faction questioned BJP and the NDA governmen’s discriminatory attitude and si-ncerity. “Gorkhas are residing in the country since Independence. The suggestio-ns of RGI and the ministry throw insight into the mentality of BJP and its government at the Centre,” Tamang said in a press statement. GJM said the RTI reply clearly questioned the community’s legal identity, for which agitations had taken place on different occasions. “GJM had an alliance with BJP in the 2007 and 2014 elections for Gorkhaland. Prime Minister Narendra Modi even said the dreams of the Gorkhas were his, too, and had promised tribal status to the 11 Hills communities. Yet, that very government is questioning the Indianness of Gorkhas by calling them immigrants,” Tamang said. The 11 communities — Thami, Khas, Newar, Rai, Jogi, Dewan, Sunwar, Gurung, Mangar, Bhujel and Dhimal — have been demanding inclusion in the central tribal list. The demand has been backed by GJM and the Ben-gal government, with the fo-rmer having sent its recommendations to the Centre. Further, according to the ministry, RGI felt granting tribal status would result in similar demands from people of Nepalese origin in other states. “The community is spread across the country, including in the northeast, Bihar, Bengal, Uttar Pradesh, Uttarakhand and Himachal Pradesh. There would be similar demands from these states and the inflow of Nepalese immigrants will increase if the said communities are granted ST status,” a letter from the RGI to the ministry in March 2017 said, which is mentioned in the RTI reply. Condemning Modi’s silence on the matter during the public meeting in Jalpaiguri on Friday, Tamang said the Gorkha community would give a befitting reply in the upcoming election. “He did not utter a word about his promise in Jalpaiguri on Friday. BJP and Modi have only betrayed us. We will not tolerate the insult any more,” he said while pointing out that the budget session would end on February 13 without the bill for granting tribal status to the Hills communities being tabled. Gorkha Janmukti Morcha (GJM) on Saturday condemned the reference to and labelling of India’s Gorkha community as immigrants from Nepal, as suggested by the tribal affairs ministry.